From that forest also came this. You know most of the story. Rubber became a major industrial commodity in the 19th century, and the supply came from rubber trees growing here and there in the Amazon forest. Then a wicked English gentleman, rather proud of his skullduggery, absconded with some rubber-tree seeds and spirited them away to Kew Gardens, from whence (can't beat that word) a later generation of rubber-tree seeds was taken to establish plantations in Ceylon and points east. Tappers no longer had to wander through the Amazon forest looking for another tree to tap. Bye-bye, Brazil's trade. The curtain fell about 1920. 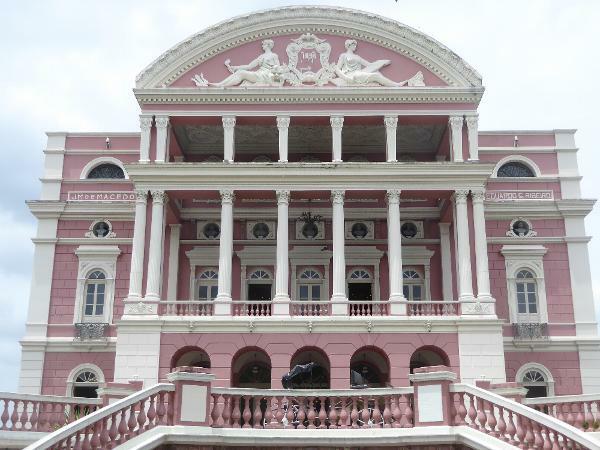 Here's the prize relic of the boom, the Teatro Amazonas. The names up top are an odd mix: Joaquim Macedo was a novelist and playwright. Not so, Eduardo Ribeiro. Instead, he was the monumentally prolific governor of Amazonas in the 1890s, when the city had money to burn. That isn't always such a good thing: Ribeiro was forced from office and a few years later was found dead in his hammock. He was 38. There are several juicy stories about this. Ever cautious but nonetheless overflowing with expertise from TV procedurals, we may venture that his death wasn't from natural causes.